The Shure ANI22 Audio Network Interface provides 2 channels of Dante-to-analog and 2 channels of analog-to-Dante conversion. 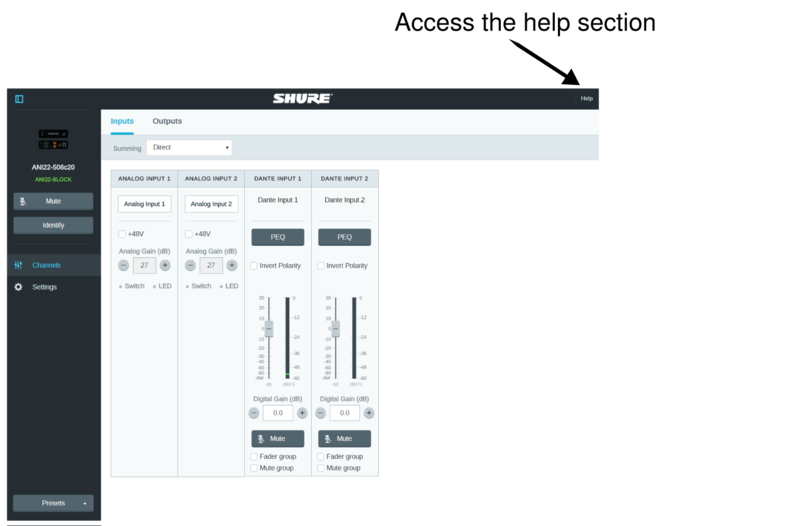 A single interface provides a simple way to connect analog equipment to the audio network, such as wireless microphones, audio processors, video codecs, and loudspeaker systems. Available in XLR and block connector versions, each box uses a single network cable to carry audio and power through Power over Ethernet (PoE). A browser-based web application controls audio and network settings from any computer connected to the same network. Use an Ethernet cable (CAT5e or higher) to connect the ANI22 to a network switch. Note: The network switch must provide Power over Ethernet (PoE). Make sure to connect to a PoE port, since many switches do not supply power on all ports. Double-click the device to open the web application. Tip: If setting up multiple Shure devices, use the Identify button in the application to flash the lights on the device. Find the MXA310 in the list of Dante transmitters, and select the plus sign (+) to show all channels. 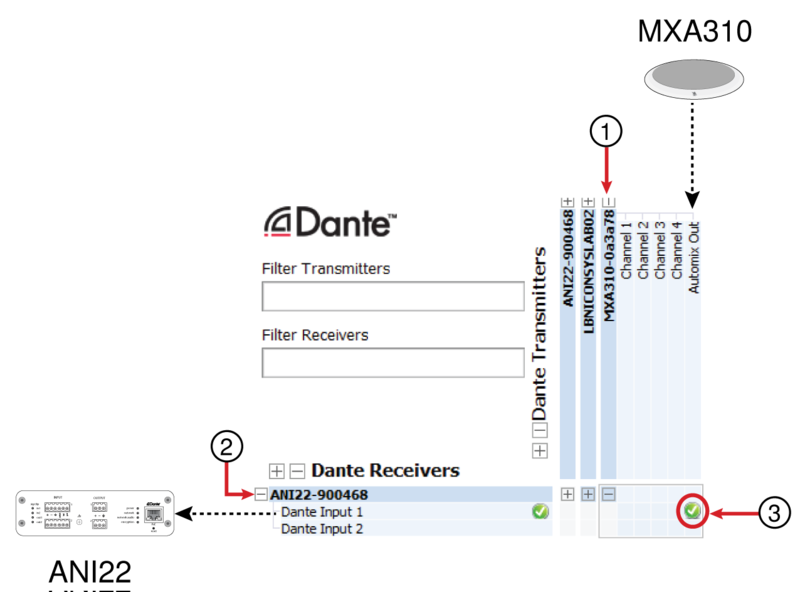 Find the ANI22 in the list of Dante receivers, and select the plus sign (+) to show all channels. Connect analog equipment (such as loudspeakers or wireless microphone systems) to the analog inputs and outputs. Refer to the hardware section in this guide for information on connections and LED metering. In the ANI22 web application, adjust input and output levels and perform a sound check. Refer to the help topics in the web application for additional information. Each indicator corresponds to a single channel. 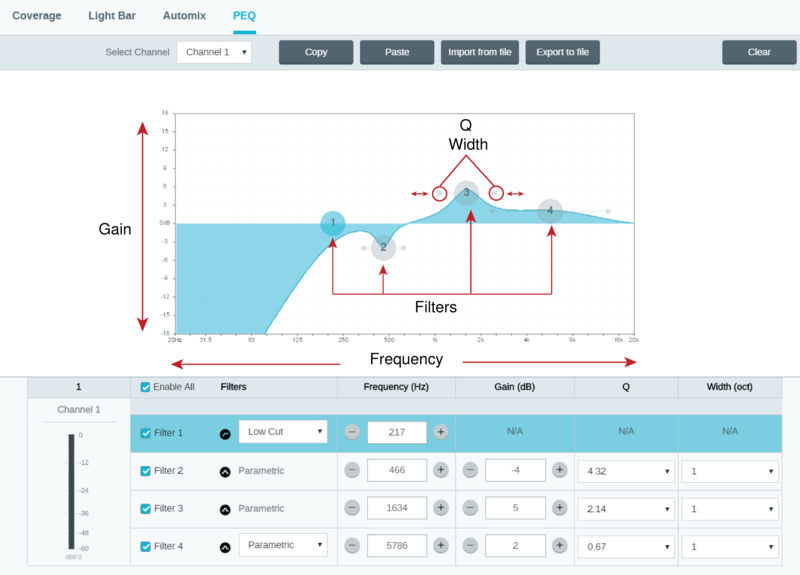 Analog and digital gain adjustments are made through the web application. If an input channel LED turns red, attenuate the level from the source device to prevent clipping at the input stage. If an output channel LED turns red, lower the corresponding Digital Gain (dB) fader for the Dante channel under the Input Channels tab. 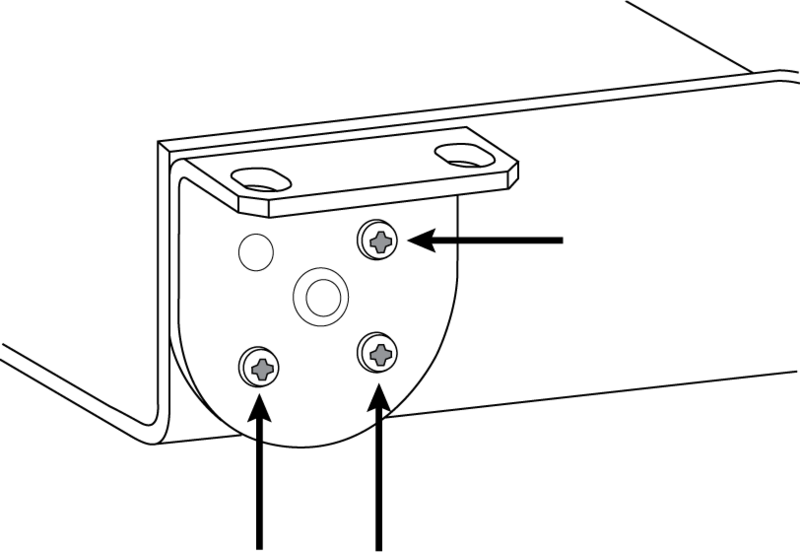 Do not lower the output level (line/aux/mic), as any clipping indicated on the LED occurs before the final output level stage. 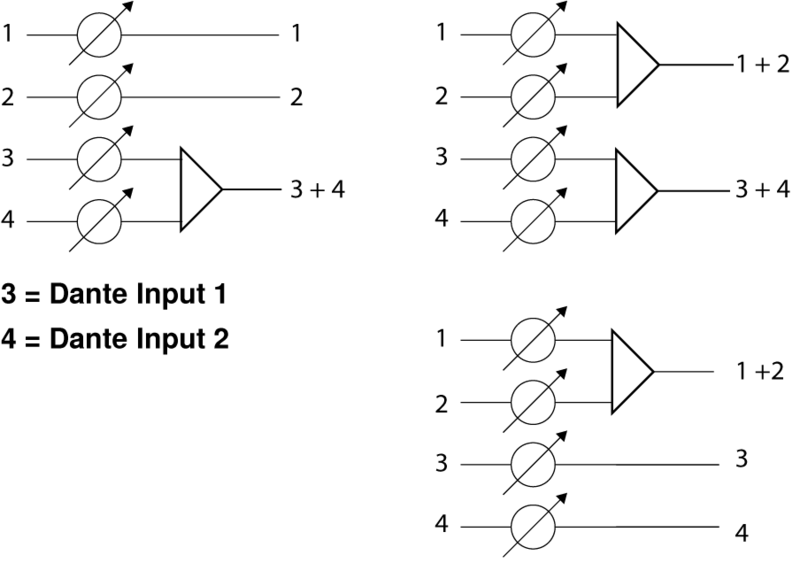 Note: Logic connections are only featured on the block connector version. Note: Error details are available in the event log in the web application. Connects to a network switch to send Dante audio, while receiving Power over Ethernet (PoE) and data from the control software. See the Dante and networking section for additional information. ① Analog Input with Logic Connection (MX392) In addition to running the audio signal, this boundary microphone features three additional wire leads for logic connections. This allows the switch on the microphone to send a logic mute signal to other equipment on the network, and to receive a logic LED control signal. ④ Dante-enabled Equipment Dante microphones, such as the Shure Microflex Advance ceiling and table arrays connect to the network switch and can be routed using Dante Controller software. ⑤ Control CPU A computer connected to the network accesses the web application to control the channel levels and processing. ⑥ Network Switch The network switch provides Power over Ethernet (PoE) to the ANI22, while also supporting all other Dante-enabled audio equipment. The Audio Network Interface provides channel summing to combine input signals and send them over a single output channel. This makes it possible to send all channels to a device with a limited number of Dante receiver channels or analog inputs. The relative channel levels are not affected; the mix is summed in the device and sent over a single output channel. Note: When summing is enabled, a limiter is activated to prevent signal overloading. The limiter does not affect the direct outputs, and will only affect the summed signal. To combine channels, select one of the summing options in Channels > Inputs. 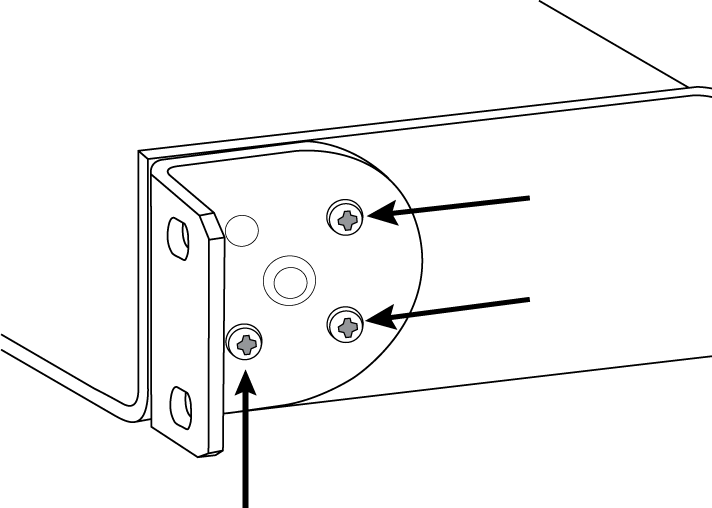 The block connecter inputs feature three logic signal connections. Logic signals are converted into Ethernet command strings and sent and received by any device (such as an echo canceller or control system) that supports Ethernet command strings. 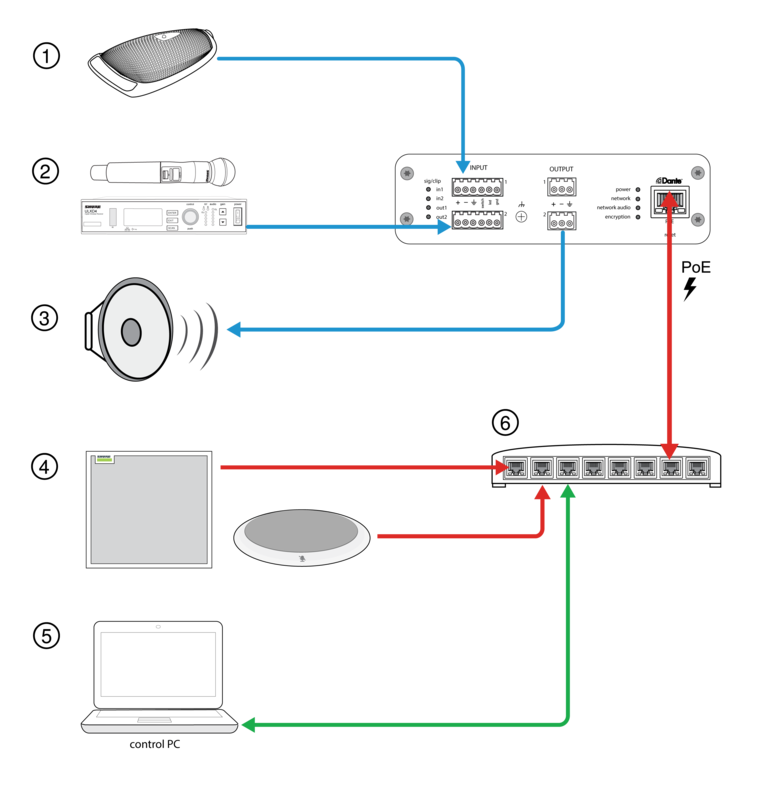 In this diagram, Shure MX392 Microflex® microphones are connected the audio network interface. The mute button on each microphone sends a logic signal (switch) to mute other audio equipment. The microphones receive logic signals (LED) so that the microphone LED behavior reflects the state of the entire audio system. Levels for Microflex Advance™ microphones are adjustable through their web application. The digital gain adjusts the level of the signal before it reaches the analog circuitry. Set these levels as high as possible without reaching the peak level (0 dB) on the meter. Before you begin, verify that levels from the analog devices with adjustable output levels are operating at nominal levels. The analog gain adjusts the level of the audio signal before it is converted from analog to digital. It is adjustable in 3 dB increments, with up to 51 dB total gain. The meters should peak between -18 and -9 dB. Note: Leaving some additional headroom is a recommended to prevent clipping if mobile devices will be plugged into particular channels. Output levels are controlled by the Digital Gain (dB) fader. Always adjust the input gain before the output gain. In most cases, setting the analog gain correctly results in an appropriate output level. Sources that have a quiet signal, such as a microphone with low sensitivity, may need some Digital Gain (dB) applied. If the output is clipping, use the Digital Gain (dB) fader to lower the signal. Note: If summing is enabled on input channels, use the Digital Gain (dB) and Analog Gain (dB) controls in the Input section to adjust the mix. Red: Audio signal is clipping and should be attenuated. Each Dante channel includes a meter to measure signal levels (dBFS), located in the web application under the input and output sections. Pre-gain metering measures the signal level without digital gain applied. It does reflect analog gain adjustments on the two input channels. Post-gain metering measures the signal with both analog and digital gain applied. To change the metering setting, open the Settings menu, select the General tab, and adjust the Metering setting. 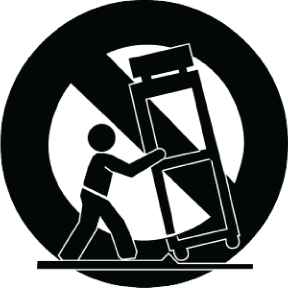 Important: If the incoming signal is adjustable (wireless microphone systems, for example), make sure it is at the nominal level before adjusting the analog gain on the Audio Network Interface.